I didn’t intentionally take a four month blog break, but somehow actually participating in life got in the way of blogging about life. I’m sure that I’ve pretty much lost all of my readers, but if you’re still hear, leave a comment and say hello again. We’ve done a bunch of traveling in the past few months, with trips to Healdsburg, Washington, and even Angola, Indiana in May alone. Getting to spend so much time with friends and family has really helped me shake off the dregs of last year and enjoy the new year. It also helps that a majority of my crafty time lately has been spent making cutey cute things for the babies of friends and family that will join us in the upcoming months. 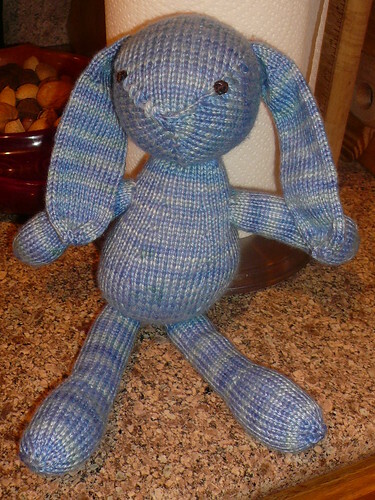 For example, I knit both Elijah (elephant) and Sophie (bunny) for the babies of a friend of Evan’s from high school. I used Zen string sock yarn for both (for more details, check out my recently updated ravelry account). I would highly recommend both of these patterns because there is no finishing involved other than sewing on the eyes. You start with the head and then pick-up stitches for each of the body parts. Right now I am working on a knit baby blanket for a co-worker’s baby due in a few weeks and a quilt for the niece that is due to arrive next week. Now that my schedule has calmed down a bit I hope to post more. Evan and I have really adjusted to life in the bay area. This might be apparent by the fact that I never seem to have time to post anything any more. Our social life and general outlook improved greatly when our friends from graduate school moved here in August with their children. 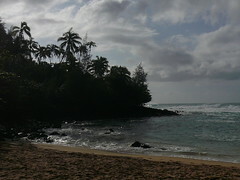 The thing that is still hard for me, after living here for over two years, is being so far from my family. When I was in Oregon, I could visit on a moments notice. The day my sister went into labor, I was able to drive up and arrive only an hour or so after she was born (she had a fast delivery). My sister is going to have a second baby in July. I’m sad that I won’t have the same accessibility to the new one’s baby years as I have had with my niece. My mom and niece came down for a visit over president’s day weekend. Despite the fact that my niece was suffering from a pretty nasty cold, we were able to have a pretty nice time cuddling, putting together a puzzle (over and over again), terrorizing both the cats and Uncle Evan with tickles. Ever since she could communicate, my niece has been pretty adamantly opposed to getting her photo taken. I have to resort to kinnearing her most of the time. 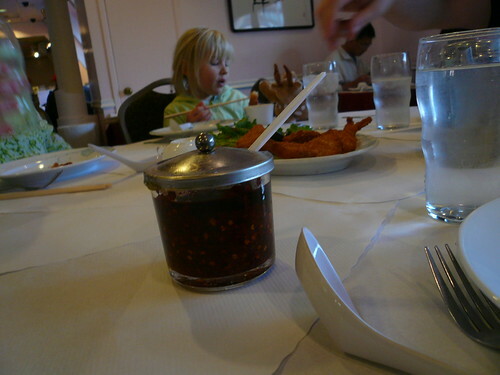 This visit I especially appreciated how she sings her way through the day (much like her Uncle Evan), her cackling real laugh, and the fake laugh that she uses to convince you of something, like to rent a ridiculous movie at the video store. I see a lot of plane ticket in my future because I really don’t want to miss these moments with her or the new one. I never find myself in front of the computer anymore. I have had two main obsessions that have been keeping me away. 1) Secret of the Stole II. I am a pretty competitive person and thus often set unrealistic goals for myself. 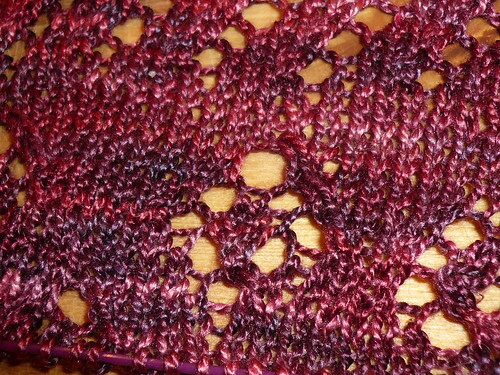 Last summer (the summer of the houseguest I like to call it) I signed up for mystery stole 3, but was never able to keep up with the weekly clues as I can’t knit lace and talk to people at the same time. I then signed up for secret of the stole last year, but never ended up even starting that project because I felt guilty about not finishing the mystery stole first, so when secret of the stole ii rolled around, I told myself that I would keep up with the weekly clues. I just finished clue 5, so I’m still meeting my goal…barely. Pretty huh? 2) The DS game Professor Layton and the Curious Village. I don’t even like playing video games, but Evan bought this game on Friday and I was pretty much obsessed with it the entire weekend. The game pretty much consists of a huge number of logic puzzles. I highly recommend it to anyone that likes logic puzzles. It’s funny because when I bought Evan the DS for Christmas, I was concerned that it might be damaging to our marriage because he would be playing it when I wanted to be social. I wouldn’t have thought that the only damage to our marriage would be the bickering over whose turn it was to play Professor Layton. I haven’t talked about what I’ve been knitting in forever, so I thought I’d take a bit of time before my ceramics class tonight and share the projects that I currently have on my needles. Status: Sleeve Island. 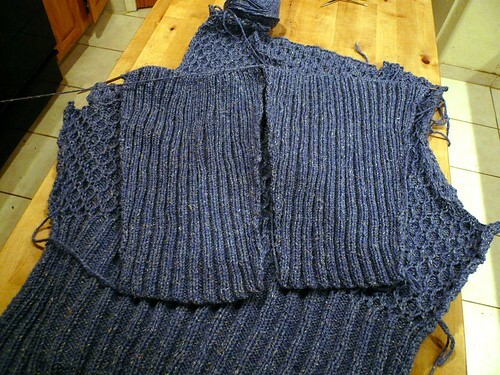 Both the front and the back of this sweater went relatively quickly, but I started the sleeves over Thanksgiving. 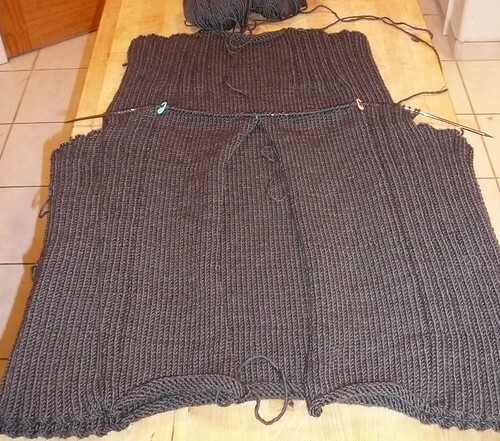 I think that all of the ribbing plus having to increase every four rows (i.e. 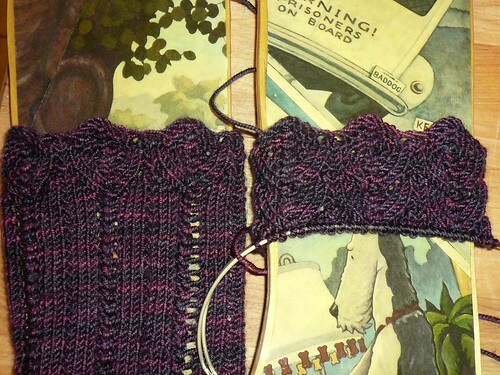 keep track of where I am) plus knitting both at the same time is making these sleeves annoying to knit. I made myself work on them last night. Status: Second sock started. I just discovered that I messed up the top of the first sock. 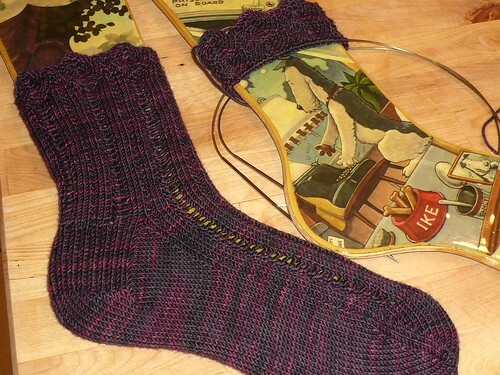 I could rip out the second sock top so that it matches, but I like the top of the second sock better. 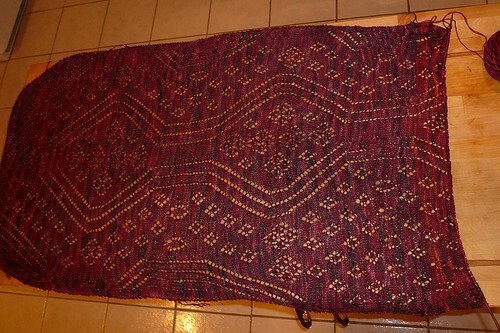 This is my car and about the town knitting. Status: I am currently working on the fronts. 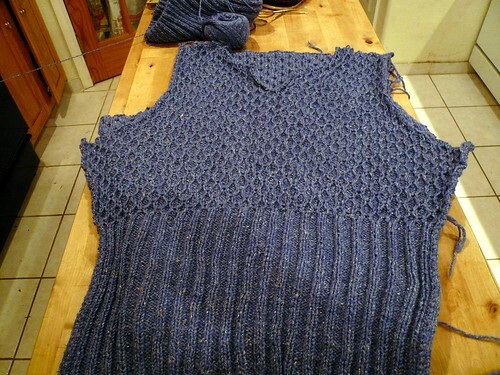 I feel like between this sweater and the Stacy sleeve, I have altogether too much ribbed knitting going on. I really love the Aurora 8 yarn. It is smooshy and soft. Status: I finished clue 1 on Sunday, so I am completely caught up. I originally planned to use this yarn on the first secret of the stole, but had too many other things going on at the time. 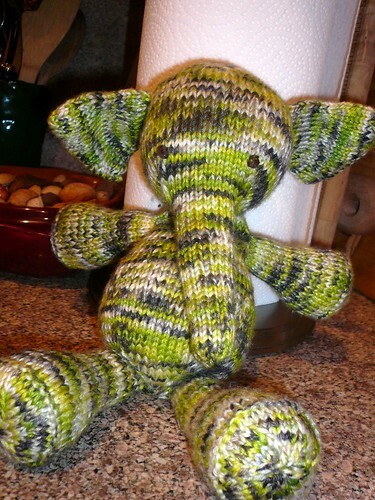 I think I’ll like this pattern better anyway. I read about the pay it forward gift exchange over at PoMo Golightly and had to instantly sign up. I have been on a good finishing kick this weekend. I finished the trellis sweater I have been knitting (but never got around to blogging about) and I finally finished the tuscany shawl as well (pictures to follow at some later date). After getting the house picked up this morning and sewing a Christmas thing for a friend, I feeling pretty darn industrious. With the clutter cleared from both my brain and my house, maybe I can get around to blogging more often. So today I turned the big 3-0. I woke this morning with more melancholy than cheer. It might have been that I am overcoming the after effects of a friend hangover after spending four great days with friends in San Antonio and their teeny baby. It might be that I am feeling guilty for having boarded the cats for the first time over the long weekend. After the great Quincy debacle of our last vacation, we didn’t want to leave them with a cat sitter and risk another random escape. After five days at the kitty inn (cats only, no dogs allowed), however, Muffin has lost a ton of weight. She’s all bones right now. She’s eating and seems to already be filling back out, but I feel bad about the stress it caused her. It might be that my birthday is on a Wednesday and, really, who wants their birthday to be on a Wednesday? If I look at things with even just a smidgen bit of perspective, I am pleased with where I am at thirty. I am living a much happier, more fulfilling life that I might have predicted. I never expected that I would actually get to go to college, especially a college like Reed. I always knew I had the grades to get into college, but I was never convinced that the finances would be there to make it actually happen. The same goes for graduate school. I can still remember how elated I was to find out that you do not have to pay (and in fact get paid) to go to graduate school in the sciences. Growing up I didn’t think I would ever get married. I never expected to find someone that would love me and the family that comes along with me, idiosyncrasies and all. What I’m trying to say, I suppose, is that I am thankful for all of the unexpected delights, big and small, the last thirty years have brought with them. Happy birthday to me.